London Design Festival 09: London designer Benjamin Hubert's collection of blown glass lamps for design brand Authentics won the Best New Product award at 100% Design last week. The collection, called Labware, is composed of three forms inspired by traditional laboratory beakers. 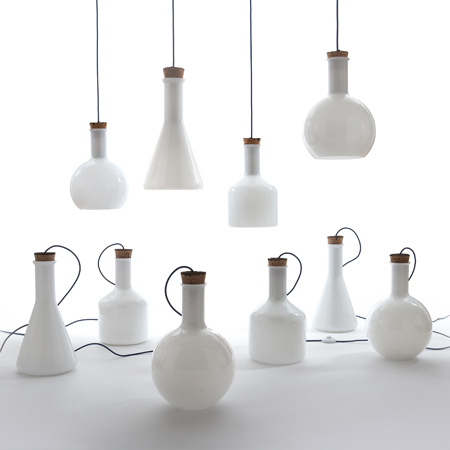 The lamps consist of blown white glass, plugged with stoppers made from hand-turned, bark-topped Portuguese cork. Hubert originally designed the lamps as a set of floor lights in 2008, then selected three of the forms to develop with Authentics. See our previous story here. Working under the philosophy ‘original designs for life’ Authentics have been manufacturing and distributing contemporary products designed by some of the leading international designers for over 25 years. These include original pieces such as the Lockheed lounger by Marc Newson. Labware lights were originally mouth blown and hand formed into a limited edition range of floor lights in 2008. Working closely with Authentics, three of the most iconic forms of the original prototypes have been developed for global distribution. The range focuses on the process of glass blowing and is inspired by archetypal glass detailing in combination with a playful look at scale. The lamps comprise of mouth blown opal white glass in a high gloss finish, complimented by hand turned bark topped cork stoppers from Portuguese cork factories. Mouth blown opal white and clear glass with Portuguese bark topped cork and braided blue cable.